Ashwagandha, also known as Indian Ginseng, is one of the main herbs and plant extracts used in Ayurveda, traditional Indian medicine. Over the last few years, the popularity of this traditional health remedy has grown dramatically. A recent study have shown that Ashwagandha root extract can potentially delay the aging process, leaving you looking youthful and energetic longer. Ashwagandha has a large number of health benefits and uses for men and women alike: it is useful in stress, fatigue, pain, diabetes, gastrointestinal disease, rheumatoid arthritis, and chronic fatigue syndrome. Ashwagandha is also an adaptogenic herb and it is used to balance and help your thyroid. Ashwagandha (Withania somnifera) is a shrub which grows to about 3 feet tall and is naturally found in India, the Middle East and North Africa. Although the leaves and the berries from the Ashwagandha are used in Ayurveda, it is the root that contains the powerful properties which have made this so popular. The traditional names of the plant also give clues to its natural health benefits. In Sanskrit, it means “the smell of a horse,” which alludes, not only to its musky smell but also to the strength that it gives. According to the journal Advances in Bioscience and Biotechnology, extracts from Ashwagandha root may significantly enhance telomerase activity, thereby protecting against telomere loss and potentially delaying aging. The aging and lifespan of normal, healthy cells are linked to the so-called telomerase shortening mechanism, which limits cells to a fixed number of divisions. The shortening of telomeres, at the ends of chromosomes, is linked to many age-related diseases. In the scientific experiment, Ashwagandha Root Extract, KSM–66, led to an enhancement of approximately 45% in telomerase activity at a concentration of 10 to 50 micrograms. These findings are important because they indicate that KSM-66 Ashwagandha can increase telomerase activity, thereby reducing the effects of aging and possibly increase the human lifespan. You can get KSM-66 Ashwagandha in your natural health store or online in Amazon here. Did you know that at least 60% of all diseases can be in some way attributed to stress? Stress and anxiety are almost an integral part of everyday life and we are all looking for ways to reduce this. People who suffer from diabetes know how hard it can be to control blood sugar levels. Insulin resistance affects people with type-2 diabetes and can be a precursor to developing the disease. It has been found that Ashwagandha root extract has been able to normalize excessive blood sugar levels and increase insulin sensitivity.4 This means that Ashwagandha can be used to prevent type-2 diabetes and also help sufferers regulate their sugar levels. There are other foods that can help you control type 2 diabetes and it’s also interesting to note that black seed can also improve insulin resistance. 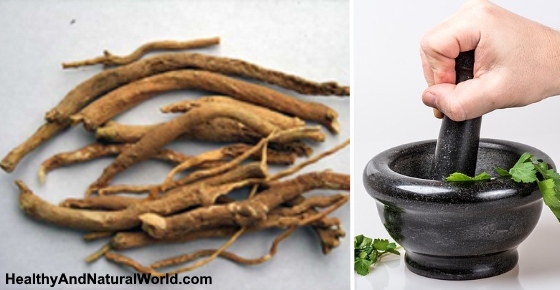 One of the ancient ways that Ashwagandha was used was in the area of sexual health. In fact, it was mentioned in Kama Sutra as a way to increase sexual desire and improve performance. Women’s sexual health – Taking Ashwagandha root extract has shown to have a positive effect on women’s general sexual health.5 A study suggests that a reason for this is that Ashwagandha not only reduces stress levels but that it increases androgens in women. You can also try to experiment with the Horny Goat weed which is commonly used in Traditional Chinese Medicine (TCM) to improve male & female libido. As well as helping to relieve stress, Ashwagandha also plays an important role in supporting and strengthening cognitive function.7 Studies show that it is able to not only improve reaction time but to prevent and possibly repair disorders of the central nervous system. It’s interesting to note that there is an anecdotal deviance that coconut oil can also be used as a natural remedy for Alzheimer’s. Are you looking for a natural remedy to help boost your energy levels? Ashwagandha may just be what you need! It may seem strange that a remedy that helps calming the nervous system can also give you energy, but that is just what Ashwagandha does. Studies have shown that taking 500 mg a day improves physical performance and strength.8 It has also been shown to help suffers from Chronic Fatigue Syndrome (CFS). If you suffer from Chronic Fatigue Syndrome, you should also read my article about D-Ribose – the most promising natural remedy for this condition. One very important role that Ashwagandha can have is in cancer treatment. It has also been shown to increase white blood cell count, therefore making it effective in reducing the side effects of chemotherapy. It, therefore, can enhance the quality of life in cancer patients; and because it boosts the immune system, can increase the patient’s life span. Make sure to read my article about the top 14 foods that protect against cancer development. Stomach ulcers are painful open sores that develop on the lining of the stomach and small intestine. This open sore is getting worse by your stomach acid, but is usually not caused by the acid itself. A great majority of ulcers are caused primarily by an infection of a bacterium called Helicobacter pylori (H. pylori) and I have already written about the best natural remedies for H. pylori. Scientists believe that Helicobacter pylori may also be a cause of stomach cancers. Ashwagandha was found to be useful in the prevention of stress-induced ulcers of the gastrointestinal tract.1 Therefore, it is a natural way to treat gastric ulcers and may also prevent stomach cancer. The anti-inflammatory properties of Ashwagandha make it an excellent natural remedy for treating all kinds of joint pain, including pain associated with rheumatoid arthritis. Castor oil has anti-inflammatory properties and it can be used to relieve joint pain. Certain foods can help to improve arthritis. According to the American Thyroid Association more than 12% of the U.S. population will develop a thyroid condition during their lifetime, and these are many millions of people. Make sure you are aware of the top 13 signs of a thyroid disorder. If you suffer from an underactive or overactive thyroid, then Ashwagandha can help balance your thyroid activity. You may not have heard of Adrenal Burnout (also called adrenal fatigue) – the stress disease, but unless you’ve been living under a rock, chances are you’ve experienced the symptoms and may even be suffering from stress disease as you read this. I have already written in great detail about the causes, symptoms and natural cures for adrenal fatigue. One study showed that over a period of 6 months, Ashwagandha helped to balance hormones of a woman suffering from non-classical adrenal hyperplasia.12 Unlike conventional drugs to help balance hormones, there were no side effects felt. Our immune system protects against disease and infections so it’s important to keep it in a top working condition (for example by consuming certain nutrients and herbs). In India, ashwagandha has traditionally been used to strengthen the immune system after illness. There are other 10 quick life hacks that can help you improve your immunity almost immediately. Cardiovascular disease is a class of diseases that involve the heart, the blood vessels or both, and is the leading cause of deaths worldwide. It’s time to protect your heart as much as possible (for example by consuming certain types of foods). The anti-inflammatory and antioxidant properties of Ashwagandha also help improve cardiovascular health. Ashwagandha is sold in capsule, powder, and liquid form. Usually, capsules are the most popular way of taking this supplement. It should be taken with meals, usually at breakfast time. There is no established dosage for taking Ashwagandha, although many have commented on what they think are effective dosage amounts. For example, 500 mg per day is viewed as the minimum dosage per day for effective results. Most supplements recommend one 500 mg capsule once or twice a day. Ashwagandha is considered relatively safe. However, pregnant women should avoid it because it can cause miscarriage and women breastfeeding should also avoid it. Because Ashwagandha boosts the immune system, if you are taking immunosuppressive drugs, then you should speak to your health practitioner before taking Ashwagandha. 1. Afr J Tradit Complement Altern Med. 2011. 2. Indian J Psychol Med. 2012 Jul. 3. J Evid Based Complementary Altern Med. 2016 Apr 6. 4. Rep Biochem Mol Biol. 2015 Apr. 6. Evid Based Complement Alternat Med. 2013. 8. Int J Ayurveda Res. 2010. 10. Indian J Med Res. 2015 Jan.
11. J Pharm Pharmacol. 1998 Sep.
12. BMJ Case Rep. 2012 Sep.
13. J Ethnopharmacol. 1999 Oct.
14. World Journal of Medical Sciences.